John Blankenbaker of Chadds Ford, with the 1970 circuit board for his Kenbak-1 computer and his home desktop. John Blankenbaker was born in 1929 on an Oklahoma dairy farm. As a boy, he would lie in the grass outside his house on summer nights and ponder the stars. “I did have an interest in the physical world. I was impressed by the stars,” he said. “And I remember wondering why a jar of water would disappear through evaporation. Admitting that he doesn't have a cell phone and uses his desktop computer primarily for doing genealogical and historical research, Blankenbaker shows a quick mind and a clear memory, and he traces his path through the technological leaps and bounds of the last century with a self-effacing tone. In those days, no one had their own computer. Universities and research institutions maintained the room-filling computers of the day, and outside parties had to line up for a time to run their research. John Blankenbaker, circa 1971, with his Kenbak-1 personal computer. Blankenbaker, who was one of four students who got to work with SEAC, wrote a program for it that didn't work. The engineers didn't know why, since it looked fine. Before that summer, in 1946, Blankenbaker had enlisted in the Navy at 16 to learn how to repair the increasing amount of electronics aboard ships. When he was a college freshman, “I happened to read an issue of Popular Science or Popular Mechanics, and it was probably about ENIAC. It had 17,000 tubes. And the number system only had a zero and a one. In those days, people never heard of things like that. I spent some time figuring out how you compute, how you convert to numbers that you understand. Then he worked on a business data processor at Hughes. That project eventually ended when the manager asked how many units they could possibly sell. “The guess at the time was that maybe 20 computers could meet the needs of the country,” Blankenbaker said, laughing. “So he said he didn't think there was enough profit in that and he canceled it. “I've always, throughout my career, underestimated the future,” he said. “I never saw the future clearly, much to my regret now. There were many investment opportunities along the way, you know? I thought some things were clever work – like this Xerox machine that made copies. What I should have thought about was, 'Where do I buy some stock? '” he said, laughing. An early ad for the Kenbak-1, and the interior of the original unit. After being associated with the burgeoning computer field for so many years, in 1970, “I was unemployed and had some extra money,” Blankenbaker said, so he decided to start tinkering with building an affordable personal computer in his California garage. He recruited his brother to help lay down the tape that would become the initial two-sided circuit boards. 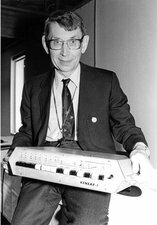 The resulting unit, which he dubbed Kenbak-1 (a shortened version of the middle of his name), had 130 integrated circuits and 256 bytes of memory. That amounts to 1 byte for each letter. The input was done by eight switches, and the output was indicated in eight lights. It was priced at $750. In those days, people simply didn't see how a computer would be of any use to them. “Even if you'd wanted one, you'd have to go down to the bank and negotiate a loan,” Blankenbaker said. He pulled out a paper that was distributed with the Kenbak-1 and showed how you could program information into the unit with a series of numbers that stood for commands. It worked on “machine language,” he said, and could do simple computations, such as determine the day of the week if you input the month, date and year. The unit was marketed to schools, a decision which Blankenbaker now regrets, because of the 40 machines he managed to sell, he had to wait for school funding processes to get any payment. “I should have gone after the hobbyist,” he said. 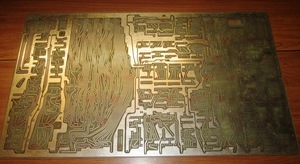 A circuit board for the Kenbak-1 was put together by John Blankenbaker and his brother. With only three employees at the peak of his company, Blankenbaker went out of business and sold the units to CTI Educational, which didn't do much better with them. The problem was that technology was changing so rapidly in the 1970s. “The thing that made computers possible was not the microprocessor, it was the memory. That's been the key factor,” he said. This Kenbak-1 was auctioned for $28,000 last summer. 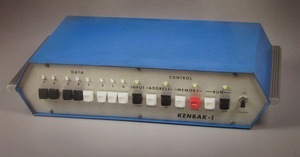 There are perhaps 10 remaining Kenbak-1 computers in collections around the world, he guessed. They were durable, but the problem in restoring them is a lack of parts. “There's one guy in Canada who has a few, but I'm not sure if they work or not,” Blankenbaker said. Blankenbaker was a relatively early adopter of computers and bought his first desktop in 1980. He is dazzled by what computers have become. “It's hard to believe the increase in the amount of data that can be transmitted,” he said. His wife has an iPad, “but she uses it to play Scrabble with her daughter. I don't use it,” he said. He regards computers as great tools, but fraught with great peril. “Cyber threats are scary, and the other big question is privacy,” he said. “The net result is that privacy is going to be eroded. You're going to have to live as if the world knows everything you do, and it's stored somewhere.